STOP PRESS THIS NOW CONTAINS THE ENTIRE SERIES EVER MADE. 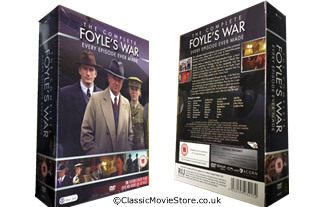 New for 2015 complete Series 1-8 of Foyle's War on 17 DVDs. Everyone ever made so far, and reduced in price. Please note we can sell these sets seperately please call 0208 123 1333. DELIVERED FREE IN THE UK. Just released in April 2013 this set now contains all series.The complete Foyles War series from series 1 to the last series 8. This classic british TV series stars Michael Kitchen as Christopher Foyle, a detective in a small town in World War II-era England who finds himself dealing with murder, spies, and treason among other crime. One of the most popular series this year.